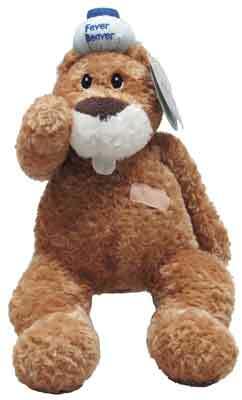 Cuddly soft get well plush brown beaver named "Weaver" from First & Main. 11" with embroidered features along with a cloth band-aid and cloth ice pack to cool down the fever that says "Fever Beaver". We got a great deal on these and are passing on the savings to you when you order your gift basket. NOTE: These are to only be added to gift baskets. Not sold separately with or without balloons.